Bridgette works as a server for Edelweiss Catering along with her friend, Ashley and Justin. Bridgette has been dating Adam Dubois for two years and is certain he will be popping the question soon. So when they meet up for dinner, she is devastated when he breaks up with her and she finds he is going to marry someone else. Heartbroken, she can’t seem to get over it. Since she is still good friends with Adam’s mother, they meet often for lunch and she insists that Bridgette remain part of the family and even wants her to attend Adam’s wedding. Awkward? Oh yeah! Bridgette's old college friend comes to town. Ian Davies is an old flame who moved to London after college graduation. Best friends through school, they had a fling but broke up after graduation. Getting together brings back fun memories for both of them and we see their relationship grow through flashbacks. Bridgette is not sure where her heart truly lies. Is she still in love with Adam or has her heart always belonged to Ian? With the help of her friends and her savvy grandmother with whom she lives, we watch her as she sorts through her feelings trying to decide which man to pursue. There are a lot of humorous moments and true-to-life events that make the reader nod their head knowing we have all been there at some point. I really enjoyed the way the author introduced the flashbacks in the book. Most of the time I don’t like flashbacks because I find that they can be confusing. But not in this book. Well done, Becky Monson. I have now read all three of Becky Monson’s novels and was so excited when I saw Speak Now (or Forever Hold Your Peace) come out. 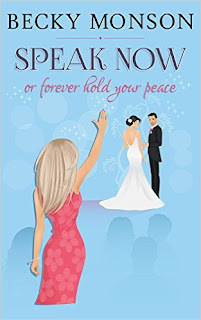 This is one very talented author and chick lit is definitely her forte. I look forward to reading more from her and hope everyone will grab a copy of this book, sit back and enjoy one of the best reads you have had in a long time. Thanks to Becky Monson for the book in exchange for an honest review. Connie Fischer is a retired office manager from NASA. Loved books from the time she could read. Spent childhood summers in her front yard tree reading Nancy Drew books and biographies. Loves historical and contemporary romance novels, chick lit and anything British. Her goal for 2015 on Goodreads is to read and review 100 books and she's way ahead of schedule. Lived in Paris, France for a number of years. Living now in southwest Florida. Ahhh...life is good! Excellent review. You have me hooked now. I need this book.